Hello? Is anyone out there? Five fellows of MACHINE DE CIRQUE are building a contraption to communicate with the outside world. Thing is, their fun-loving natures keep distracting them! 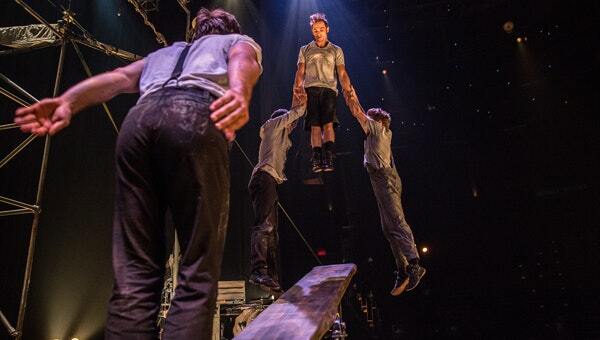 Before you can say "over and out," these awe-inspiring acrobats are swinging by their toes high above the stage, bicycling upside-down and backwards, and flipping and flying off teeterboards. Making mayhem of their scrap metal set with a live percussive soundscape, this quirky crew of daredevils sure knows how to manufacture endless comedic madness.